Why is SD FACT so important? Elections matter. Our democracy only works when lawmakers are held accountable. There must be consequences on Election Day when lawmakers spend their political capital to push bills that remove legal protection for animals or when they attempt to block bills that would protect animals from abuse. We support humane candidates who will replace lawmakers that use their power to advance cruel practices and block animal protection legislation. It is also important to support humane-minded law makers who work to pass vital animal protection bills. They give our movement a voice and that voice translates into important animal protection laws. Being a voice for animals is not always easy and so we stand up for these champions on Election Day, to say thank you and to ensure that they stay in office. How do I get involved with SD FACT? Stay Connected: Sign up for our mailing list, like our Facebook page and/or follow us on Twitter to stay up-to-date on events, volunteer opportunities and endorsements. Volunteer: We are always looking for good volunteers. We need door-knockers, phone bankers, envelope stuffers and Community Coordinators. Host a Meeting: To grow our numbers we need people who care to reach out to their networks and bring in more people who care. If you are interested in hosting a meeting in your community to introduce your animal friendly friends and neighbors to our team please let us know. Host a Fundraiser: Throw a party for animals. Would your friends and family enjoy a bunko night? A ladies brunch? A night out dancing? A bake off? Get creative and find fun ways to raise money for the animals. We can help you put together a party for animals. Donate: If you believe animals need a voice at South Dakota’s statehouse, please DONATE. I support my local animal shelter and donate money to national humane/animal protection organizations. Should I also donate to SD FACT? Yes. It is important that you support these other organizations. We are a grassroots organization of volunteers that focus on animal issues and legislation. Why and when was SD FACT created? SD FACT started in September of 2011, after two failed attempts in the state legislature to pass a felony provision for the most malicious acts of animal cruelty. 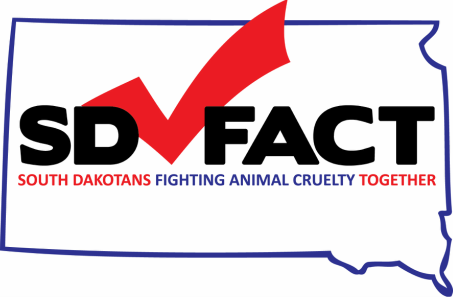 In 2013, SD FACT became an incorporated nonprofit organization in South Dakota and focused on advocating for a felony animal cruelty law. In 2014, SD FACT volunteers worked with the state veterinarian, Ag entities and local shelters on SB 46, a bill that resulted in a compromise and it passed the South Dakota Legislature. The bill became law on July 1, 2014. Following this success we expanded our board and mission, advocating for the protection and humane treatment of South Dakota’s animals. We are the nonpartisan political arm of the animal protection movement in our state. We support democrats, republicans, and independents based on a single criterion: their support for animal protection. We organize in key districts to mobilize volunteers for humane-minded legislation. Are donations to SD FACT tax deductible? No. Although SD FACT is a South Dakota domestic non-profit organization, it is not a tax-deductible charitable organization.